I got to know Christofer Gradin Franzén earlier this year and found out that he is not only an economist and a psychologist, but also a game designer. He and a friend of his have designed a board game called Cohero (do you get it - co-hero - I didn't at first and thought the name has something to do with "cohere"). Christofer visited KTH yesterday and the sustainability team thus played a board game together for the second time this term (we also played Carbonopoly earlier this term). Our team doesn't do anything but have fun and play games at work! The game itself is played on two levels (or is it three?). 1) The most basic challenge is to get away from the deserted island we are stuck on (see the map above). It's really only possible to succeed and get off the island if all players pitch in and work together, despite the fact that there can also be tensions between the individual and the collective rationality (e.g. between what's best for us and what's best for me in the game). Still, on the basic level, it's us, together, against the rest of the world. The game was in fact really tough and halfway through the game (and after some initial setbacks), I was sure we were utterly and totally screwed and would die on the island. Picture. 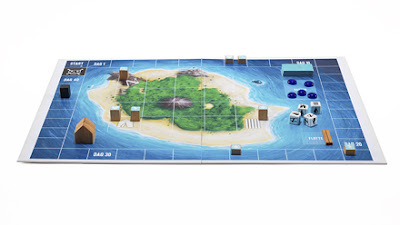 The dice will decide if you find water, tools, shelter or building materials for the raft that will save you and take you away from the island. It's actually nerve-wracking to throw the dice since the results of your dice throw is soo important. 2) On the second level it gets more complicated as we were also randomly assigned one out of four different roles. I was assigned the role of "supporter" - the social glue of the group, and a colleague of mine was assigned the role of "analyst" - the group's problem-solver. If a certain condition was fulfilled (as a social and extrovert "supporter" personality, I wanted to have two other players around me at the start of my turn), my mood would rise, and if not, my mood would be at a standstill (only one person around) or sink (no-one around). When my mood was on top, I gained a "special ability" that was useful for the whole team, but if my mood bottomed out, I gained a "negative special ability" that would impede the whole team. The problem was that it was impossible to satisfy the mood-rising conditions of all players/roles at the same time and especially so if we wanted to get something accomplished in the game (that would work towards getting us off the island). This dynamic created a basic tension between fulfilling my needs (e.g. the needs of my role), fulfilling other players' needs, and working successfully towards getting off the island. These tensions are very interesting to Christofer since he is a psychologist and he uses this game to "examine" and help work teams in companies too "see" each others' needs so as to work better together. The game requires the help of a full-time "mediator" (Christofer or someone else who has had "proper training"). "Cohero is a game that has been designed to help teams work better together. It's about the possibilities and challenges of cooperation and the possibilities for a group to solve problems of greater complexity than individuals can handle." Christofer uses the game as a Rorschach test of sorts and stops the game to discuss feelings, processes and relationships between people through the events that happen in the game. It didn't feel hurried, but we apparently hurried through these parts of the game as we "only" had three hours to play. That was a pity. It was patently obvious that a lot of thinking had gone into the game and I do believe that we could have had really long academic/gameplay-related discussions with Christofer about collective intelligence, personality types, problem-solving, psychological needs, team performance etc. In the post-game discussion, Christofer mentioned several cases when "interesting" things had happened, for example when the board of directors at a company played and everyone was very competitive. It went straight to hell since the game requires you to cooperate - including now and then subsuming your own goals to that of other persons/roles and that of the group as a whole. Another time, the people who played worked at an environmental or some other do-good organization. To them, it was extremely important that the game progressed in a "fair" way and that everyone was equally far away from death (the penalty if you fail your task - it is possible for one or more persons to die in the game and for the rest to make it off the island). Fairness is good, but here it became the overarching goal and stood in the way of accomplishing task and doing what had to be done (taking a hit in "health" for the team) to get off the island. So I'm thinking it would have been very very frustrating for me to play in any of these two groups or with other kinds of "irrational" (non-goal-oriented, non-gamer) players. In such a situation, the sheer frustration would probably have led a perceptive game mediator to learn a lot about what makes me tick. Last but not least, I do have to say it was really fun to play Cohero! Picture. From left to right: Sanna, Daniel, Elina, Christofer (mediator) and Marcus. Åke took the picture.